BPM is an abbreviation of Butterfield Photographic manufacturing Co, a company based in Sussex. 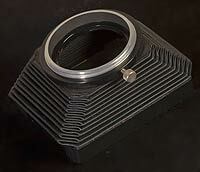 They created BPM Bellows and a range of adaptors and accessories which were a popular item in the late 70s as many enthusiasts delved into the world of Macro Photography. On this page we will give a brief guide to the BPM Bellows system accessories that were used with the bellows system. BPM made a wide range of adaptor mounts for camera and lens fittings which were sold in individuals or pairs. Each mount was hand engraved with the camera or lens fitting, as seen here with the Pentax K version. The mounts had no form of mechanical or electrical coupling so the system is totally manual. 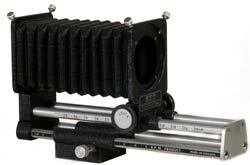 Accessory for BPM bellows system that is used with the Reprotran when copying film to prevent stray light affecting the exposure. Some, like the one illustrated here, had a locking screw on the flange that could be used with the BPM reverse adaptors so that the hood could be screwed to the filter thread of the copying lens. 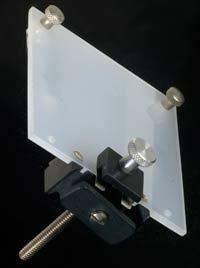 Accessory for BPM bellows system that is used for copying film. It attaches to the rails of the bellows system and the transparency to be copied is held flat on to the diffusing screen by the two spring clips. These allow the slide or film to be placed in most positions for reproduction and can also be used to copy from a portion of medium format transparency film. Once the transparency is in place and roughly focused using the bellows, the distance of the screen can be finely tuned for focus using the extended screw bolt. 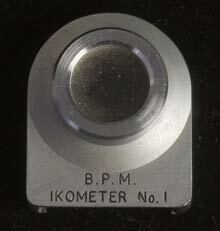 To overcome the limited close focusing capability of the Zeiss Super Ikonta cameras, Butterfield Photographic Manufacturing made this clip-on close-up lens. It features a main lens, plus smaller second lens that goes over the camera rangefinder to correct it for close-up work. There were two main types made, 1 and 2, each offering different close-up ranges. The No 1, illustrated here, focuses down to 23.5 inches (58.75 cm) and fitted Super Ikontas lenses with an external (outer) diameter of approx 50mm. A Close-Up Attachment for use with for Leica II, II,Iia etc. It came with an attachment which fits over the two Leica rangefinder windows. 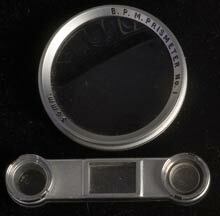 There was also a Prismeter No 2 for Leica lens with 42mm push on that offered focusing between 19� and 13� inches.